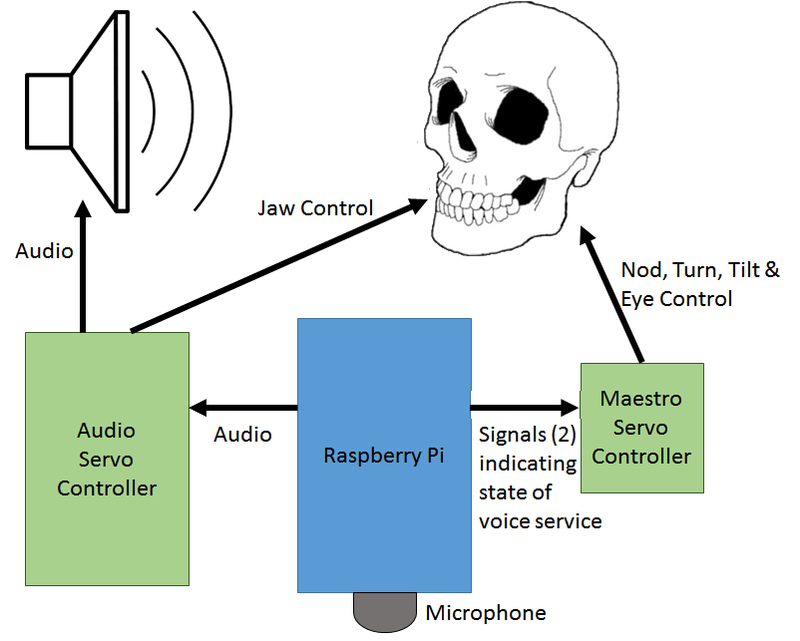 A 3-axis talking skull turned into an Alexa voice services device via AlexaPi software, Raspberry Pi, and some other tools. I like to decorate for Halloween, including various talking skeletons that I’ve set up over the years. For Christmas 2015, my wife gave me a great 3 axis talking skull with moving eyes so I could upgrade one of the skeletons from just a moving jaw skull. Then a friend suggested that there had to be other applications for the rest of the year. This got me thinking, and when I saw the Alexa Billy Bass I knew what I had to do, and the Yorick project was born. I’m pretty happy with the result. Misc. including: project box, LEDs (optional), resistors (optional, if LEDs used), breadboard (optional, if LEDs used), PVC pipe, and jumper wires. I consult on Intelligent Transport Systems. I like robotics and Halloween props, which is what got me into the mix of hw and sw.